I bought Richard a year and a half ago, and I bought him for his looks. Richard is slim, black and shiny. Richard is my first laptop, an HP Pavilion dv2000. I stopped actively dating a while ago — I am quite happy with my life. So, I named my laptop Richard and he is my everyday male companion. Besides, Richard never complains that I didn’t do the dishes; in fact, he never even visits my kitchen. Recently, Richard died. He just stopped booting. I went to Best Buy to try to fix him, but they told me that I could get a new one for the cost of his likely medical bills. Why had I gone for the looks? Hadn’t I learned this lesson already with my men? This time I got a hold of myself and decided that, for my next laptop, I’m going to ignore looks altogether. My two priorities were reliability and compatibility with my operating system Ubuntu. Everyone suggested Lenovo Thinkpad. I went shopping. Even though Pavilion was still the most attractive, I turned my back on it and bought the Thinkpad. I decided to name my new laptop Bond, James Bond. Now whenever I’m working, I am actually bonding. And, of course, his looks can be changed. I dressed up James. 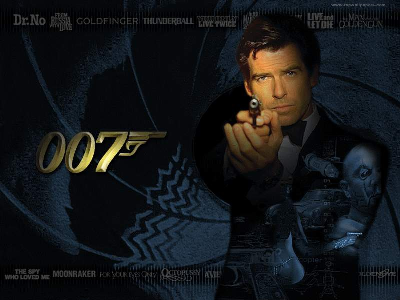 I gave him striking wallpaper featuring Pierce Brosnan, the most charming James Bond actor. Now James’ looks are improved, plus he is very reliable: he aims his weapon at me any time I want — all I need to do is close the windows. While I was getting acquainted with this new man in my life, I stumbled upon an article about extended warranties from credit cards. Though my HP warranty expired, my extended warranty from the Visa card I used to buy Richard, was still valid. So I went to MicroCenter for a repair estimate. To my surprise it appeared that Richard could be recalled. I probably should have returned James, but I wasn’t absolutely sure that Richard would be resurrected. Besides, I was scheduled to give a talk in Dallas for which I needed a laptop. So I kept James. In a couple of weeks I got my Richard back. He is alive and well and without any hint of amnesia: no file was lost. When I am dating someone I am happy and glowy and, hence, I am more attractive. When I first start dating someone, I feel insecure and nervous that I might be dumped. Thus, I need a backup to relieve my anxiety about potential pain. So, I make an extra effort and bring a second man into my life. I have had many problems in my life, especially with men, but I went through two years of psychotherapy and changed my old patterns. I really do not need two men at the same time any more. I am not sure I need one man. So why on earth did I end up with two laptops? Is this a sign that I need to go back to therapy? Let’s hope not. I just need to reject either Richard or James. But, whom? Richard is an old friend. James is new and more powerful. Unfortunately, both of them are not without character flaws. Richard has energy problems: something is wrong with the battery. And James has communication problems: his wireless card is not working. I have two laptops and neither of them satisfies me fully. Maybe I should go back to therapy after all. Another great post! Work and family are slightly overwhelming right now, thus why you don’t hear much from me the past few weeks, but I do so enjoy your blog! Unlike people, technology is tangible and numeric. Faster is better, more pixels is better, more memory is better. If for some reason you’re not happy with either, then sell both and get yourself one taht satisfies every specification. But I too recommend a Thinkpad for Linux compatibility (and as a shield in hand-to-hand combat). Dell also works reasonably well. My quasi-invariant suggestion for computer tsuris is “Get a Mac.” However there is a current of thought that considers Macs as female, so I will refrain in your case. Good one. 🙂 I have faced something similar about my cell phones. 😉 My older one was called Snape and new one is called Marvin. The result of this useless pining was that I neglected Marvin and all his good qualities for a long time.